Goodbye Fall, Hello Winter. 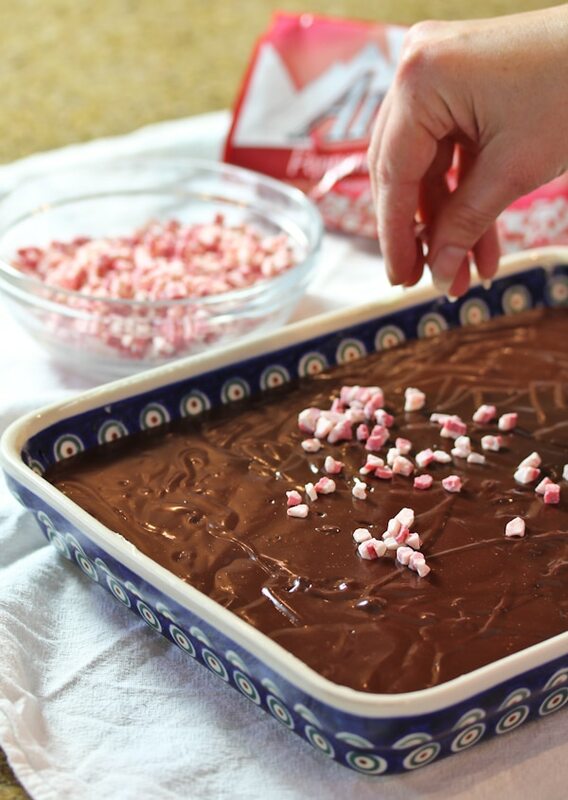 There’s no better way to usher in the winter holidays than with a good dose of chocolatey Peppermint Fudge. My family has had a roller coaster fall, filled with moments of sheer chaos and others of light-hearted bliss. Knowing I needed a little pick-me-up, my husband surprised me with my first hot air balloon ride. I cannot express the overwhelming childlike delight I felt, riding high above the mountain tops, drinking in the crisp air and heavenly surroundings. It was an occasion I will never forget. 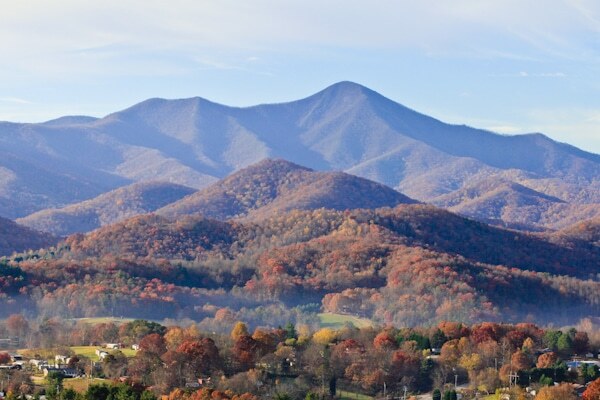 The perfect way to say goodbye to fall. But now I’m ready for Christmas and all the excitement it entails. This time of year, dreams of sugar plums dance in my head… along with a plethora of dancing cookies and silky Peppermint Fudge. Chocolate Fudge has a reputation of being a bit of a diva: temperamental, hard to handle, you never know how it’s going to react. 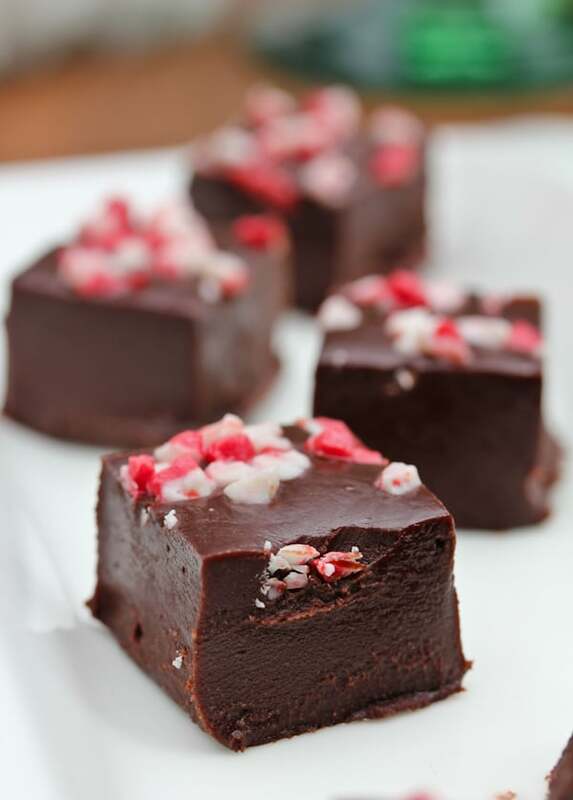 Well honey, this Chocolate Peppermint Fudge Recipe is a low maintenance kind of girl: simple, straightforward, and easy to be around. 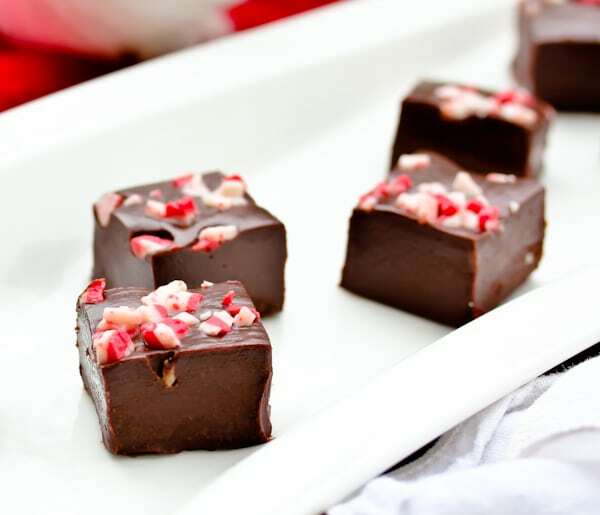 This peppermint fudge recipe is a fantastic spring board for all-things-fudge. With just a handful of ingredients you get a soft sinfully silky, yet dense, fudge that screams HOLIDAYS the moment you taste it. The texture of GOOD fudge is derived by SLOWLY melting the chocolate into the mixture. Heating the chocolate too fast will result in grainy fudge. The best way to do this is by heating the chocolate mixture in a glass bowl sitting over a small pot of simmering water. You could also microwave it in 30 second increments, on medium heat. IF… your fudge does get grainy, that means it heated too quickly and is starting to dry out. You can fix it by adding WATER. Add about 1/4 – 1/2 cup of water to the mixture and bring the temperature back up. Stir until a smooth, yet THICK, texture appears. To set properly, fudge needs to be the consistency of a REALLY thick cake batter. ALMOST to thick to pour, but not quite. If it’s looser than that, it won’t firm up enough and will be hard to cut and pick up. Keep the mixture over heat, until the right thickness is reached. For a bubble-free consistency, I like to gently tap the fudge pan on the counter. Not just a couple times, but for a minute or two. This works all the air bubbles up to the surface. Fudge is very quick to make, but takes time to set. Plan for anywhere from 3 to 8 hours in the fridge before cutting. Looking for more holiday treat recipes? We’ve got you covered here! Does it have to be a glass bowl? I have a double boiler pan, but it is metal. Thanks. I’m going to make it this morning for a party tonight! Hello i was just wondering if i could use crushed candy canes? I live in Canada and have never seen the andes peppermint chips. Or could i just cut up andes squares? 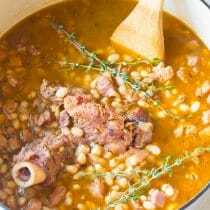 Thank you for your time and wonderful recipe. Wow, this looks delicious! Perfect for the Holidays! What is “dark” chocolate – unsweetened? I cant find the Andes chunks where i am. Anything else i can replace them with? Are they the same as peppermint baking chips? We don’t have any Andes candy in New Zealand. Could I use crushed candy canes? What is the texture of the Peppermint chunks, chewy or crunchy? Thanks. I would use the old-fashioned candy sticks that melt-in-your-mouth like butter mints. Red Band is one brand. Is your butter salted or unsalted? I made your recipe using unsalted and it seemed fine, but I wanted to clarify. Thanks. People said it was rich and good. 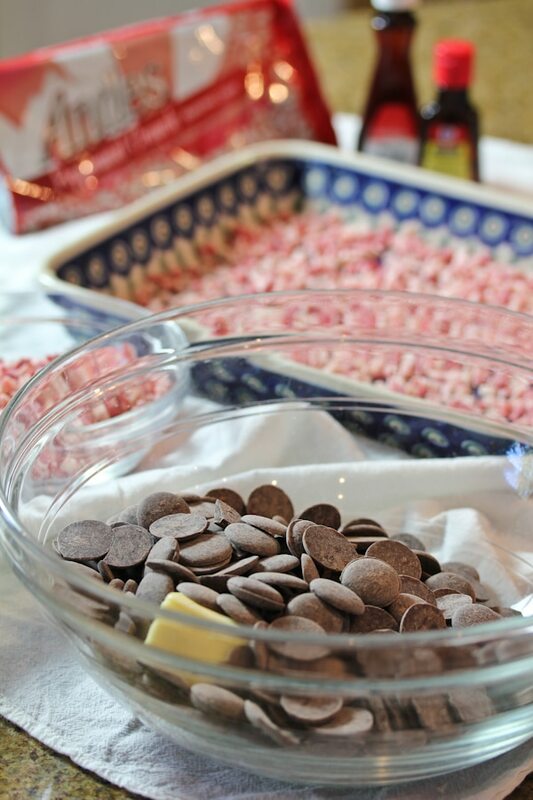 Pingback: Homemade Candy Recipes: Top 10 Chocolate Recipes to Make and Share! I am going to try this recipe with Spearmint essential oil instead of peppermint. Yum! Looks so good! I love mint and chocolate together. I’m definitely going to try this for my holiday baking! Does 1-TB butter mean one tablespoon, or something else? The photos are gorgeous. I want to make the fudge for a party next weekend. Where can I get the Andes peppermint crunch? I found it on-line but might not get here in time. Thanks so much for answering. T.
Does the bowl have to be glass? 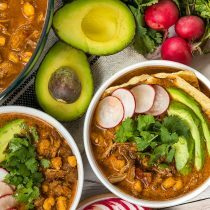 Would a metal bowl work? Wow. These photos are divine and make mouth water! Gorgeous fudge that is definitely gift worthy. 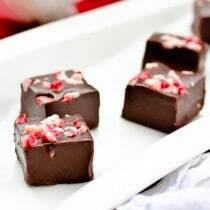 Pingback: A Perfect Holiday Treat: Peppermint Fudge! Found some of this fudge in your freezer, while you were sunning in Hawaii. Took out four pieces and we ate it while watching Puss In Boots at the movies yesterday. Wow, some tastie fudge–and the kids with Pops and Nans loved the movie. Hurry home! Omg thank you so much for the tip. My fudge always turns out grainy and i could not figure it out. Ug. I didn’t get it right. Mine was more like a chocolate brick. I melted the chocolate slowly, must not have been slowly enough. It became grainy and dull. I’m so mad. I want to be a good candy maker, especially fudge. Oh well, it still went into peoples holiday goodie box. Tasted fine. I haven’t made fudge in years! This recipe just may be what will break that. Perfect for the usual baked goods swap during Christmas! You had me at peppermint! Gorgeous photographs and the chocolate peppermint is so perfect for the holidays. Such a great gift. Drooling over the pictures. What a nice winter treat. Looks delicious! I love the combination of peppermint and chocolate, the perfect holiday flavor combo! What a delicious looking fudge. Totally loving it! 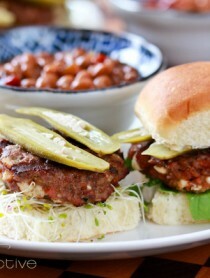 This looks really rich and seems quite easy to make. Great photos, Sommer. Who doesn’t love fudge! I am not an expert at candy making so I’m happy to have this post. I just may try making some! Looks so yummy! Those pictures are gorgeous! But I am so glad that I get to see them from my desk because I am scared to death of heights! I would have kept my eyes closed and missed the entire thing. 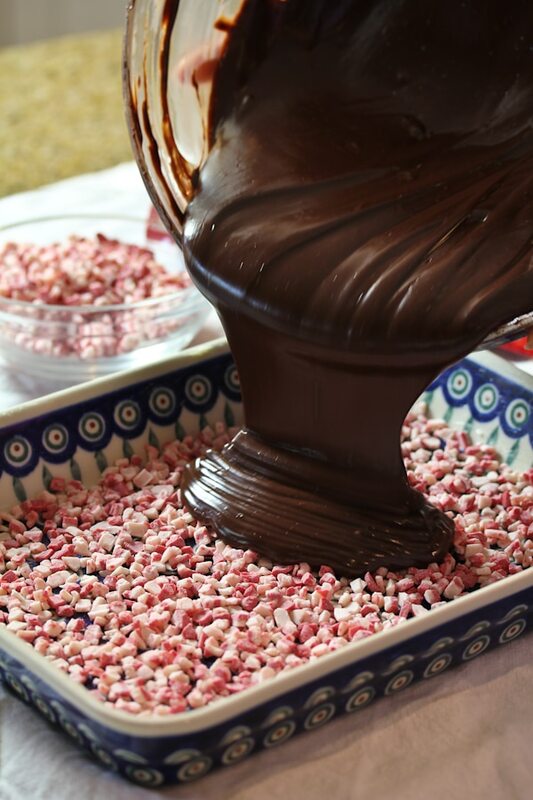 oh, my, I am not a chocolate fudge fan…but peppermint and chocolate sounds DIVINE. thanks, Spicy! LOVE the photos from your fabulous experience. 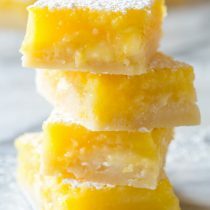 I have to admit I’m not a huge fudge fan (too sweet), but I’ll also admit, these photos of yours make me want to make it! I always make babka for gifts and last year i got tired of it and started making new things. 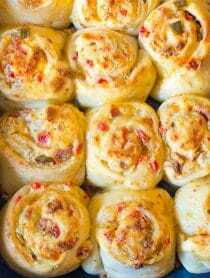 This sounds fabulous for gifts this year, saving the recipe! Oh, you won’t catch me up in a balloon. I got dizzy last week when we visited Hoover Dam! Hubby thinks I’m wimpy! : ) Lovely fudge and great tips. I just want to reach in my computer and grab one! That looks delicious! It’s time to get on the holiday fudge bandwagon here! This looks awesome, and what great fudge tips! Can’t wait to try it. That looks positively divine! What a sweet hubby to surprise you with a balloon ride and man, what a view! I am SOOOO jealous of all of your beautiful red and orange trees! In California, the only trees that turn pretty colors like that are the ones that are planted in shopping centers and center divides on large streets. It’s so artificial! Also, the fudge looks AMAZING. I make a million cookies with my mom every Christmas, including fudge. The best we ever made was last year when I accidentally started making brownines instead of fudge…and then after finishing the brownies, accidentally 5x-ing the recipe…anyway, I sat there and stirred the fudge until my mom got enough pans ready. I was sure it was ruined, but it turned out to be the best we’d ever made! Just fabulous!! 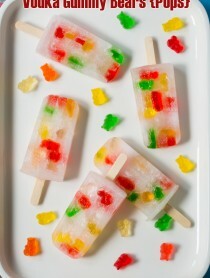 I “need” to make this very very soon!! Yum. This looks so delicious. I love peppermint and never get enough! Your photos from the balloon are just gorgeous! And I love this fudge. A lot of people use white chocolate for peppermint fudge and bark, but I can’t stomach white chocolate so I always appreciate recipes like this! This fudge looks so good. I love the chocolate and peppermint combination. 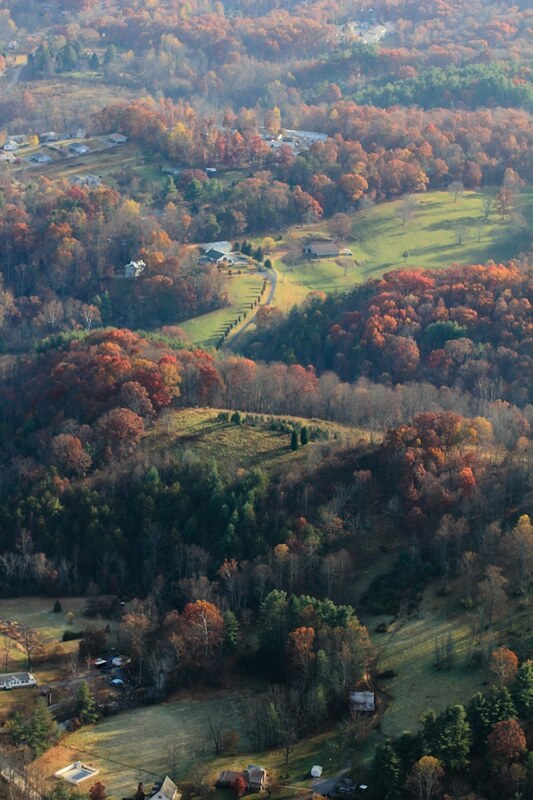 Your photos from the hot air balloon are stunning! what beautiful photos of ballooning, this fudge looks amazing! looks like the hot air balloon ride was amazing. Gorgeous photos! This is the most festive, lovely fudge. And what a sweet hubby…your views were breath taking…thank you for sharing them with us. Peppermint and chocolate. The perfect combination. Great pictures. Come visit us. We have pumpkin fried rice today. Be sure to stop by on Friday and register for the dress we are giving away from the Shabby Apple. I am pinning it to my Xmas board! Love the pics!! How sweet is he, you totally deserve a treat!! I love, love fudge and what better month than Dec to indulge with this sweet treat!! Mmmm, this fudge looks great; however, I’m not sure if I’m ready for Winter yet! Perhaps because it’s 80 degrees today in San Diego. I am in love with this grouping of photos, so rich! This fudge could get me in to some serious trouble! And I mean SERIOUS!! Looks so freaking god! That peppermint fudge looks so delicious! 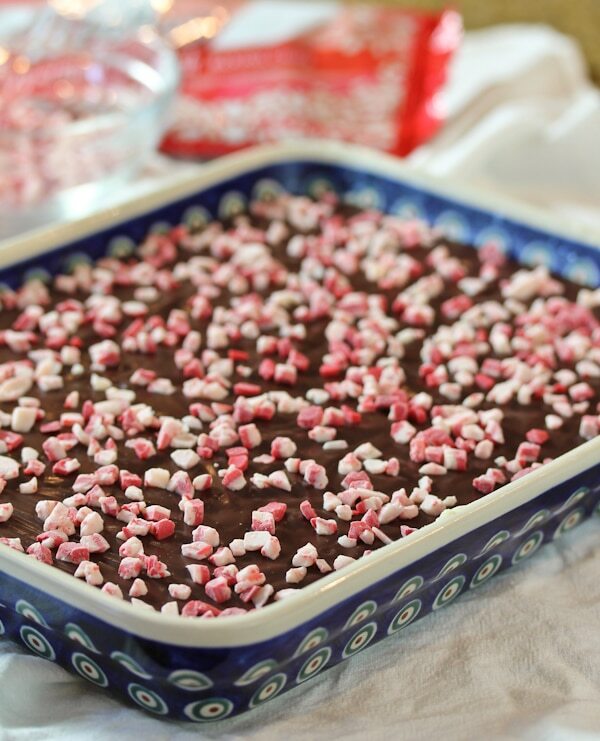 This year I have become mildly obsessed with peppermint and chocolate, so it’s always great to find another yummy recipe. Oh I am so ready for Christmas too! I can’t wait to bake tons in December. This fudge looks absolutely wonderful. 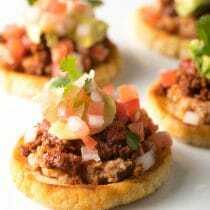 Going to try and whip up a batch of these for the holidays or one of our rescue holiday parties. I’m sure I will get chocolate all over the kitchen but it will be worth it! I’ve always wanted to go an a balloon ride but get nervous at the thought of being up so high! The view from up there looks amazing though. That fudge looks to die for. YUM! 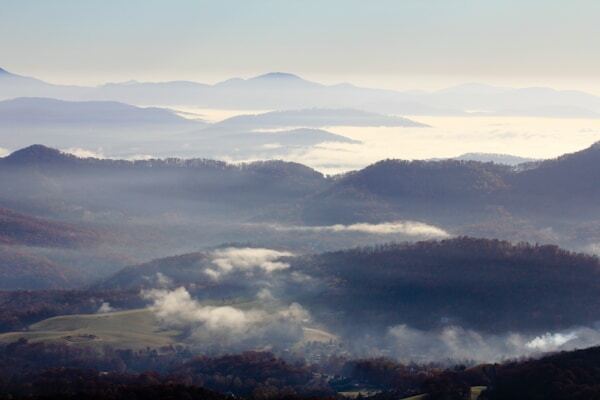 Wow, gorgeous photos of your hot air balloon ride – your hubby sure knew what you needed! Peppermint and fudge. A great combo for sure! Oh my goodness!! This looks so delicious..chocolate and peppermint..the perfect combination. 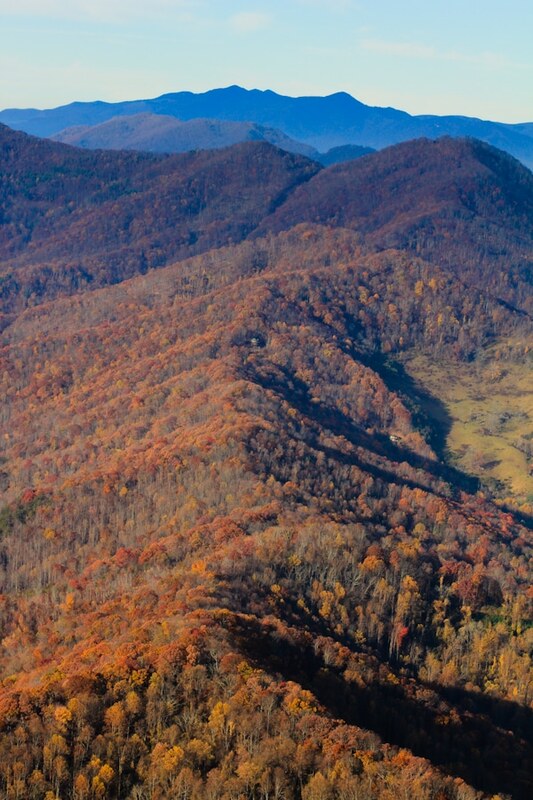 And those pictures from the balloon ride look beautiful. What an amazing experience that must have been! Sommer, Great pictures from your balloon ride! How sweet of your husband. First, I really like the fudge dish. I almost bought one of these Polish pottery dishes the other day. They are so pretty. I have never made fudge, but your instructions look pretty straight forward. I am sure my family would love it. Thanks. 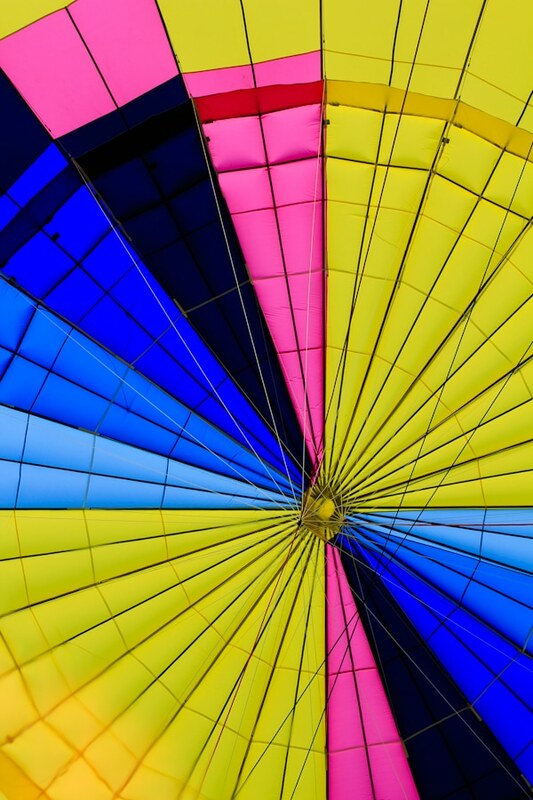 What fantastic photos of your hot air balloon ride! It looks as though the colors were spectacular. As for the fudge – well, chocolate and mint epitomize the holiday season for me. I could eat some of this treat everyday of the holidays. love those pix! not much i miss about the east coast, but fall colors are at the top of the list. The fudge looks delicious, too, but man do I have to recover from Thanksgiving first! How stunning! I have never been in hot air balloon – must be so incredible. You just put me in the holiday mood with these!